Which Mavic 2 Is Right For You? The long awaited Mavic 2 is finally here! There’s a lot of new features to talk about and an even larger amount of questions people are asking, but the biggest question for most of us is which drone to buy and why. There are a lot things to consider. Most of these things have to do with the camera and what your end goal is. What’s the best choice for someone else may not be the best choice for you. This is the first time DJI has released two separate models of a drone, and didn’t give them a clear distinction of features. You really have to do your research and read the features of each one which takes a lot of time, and can be quite overwhelming to the average consumer. But if you’re an experienced photographer/videographer and you know what you need, the choice should be pretty clear at the end. You could get the Mavic 2 Zoom, or the Mavic 2 Pro, but both seem to have their own advantages, and disadvantages. So in this article that’s exactly what I’m going to go over. First we’ll cover what each drone offers and why it’s important to you. Once you’ve learned what you need to know, then you can take a look at our comparison shots to get a real world example of all the differences. Let's start with the main difference... The cameras! Since the DJI Mavic 2 Pro and Mavic 2 Zoom are basically identical I'm going to be focusing on the two different cameras throughout most of this article. The Mavic 2 Zoom has a great camera design. It’s small, symmetrical, durable from what we’ve seen so far, and with a rounded design, it should be easy to find neutral density (ND) and circular polarized (CP) lens filters. The Mavic 2 Pro has a very unique camera. Because of the larger image sensor size, they had to figure out how to make it larger while still being small enough to fit inside of the same area on the drone. To do this, they had to make it square on the outside with a smaller rounded lens on the inside. When I first saw this camera, I thought it was a bit strange, but the look has been growing on me after seeing it in person. The ND filters for the Mavic 2 zoom are great. They come in a set of four which includes ND4, ND8, ND16, and ND32 filters. The set also comes with a sturdy case lined in silicon. There’s even markings for each filter space so you don’t have to take each filter out to find the one you need. The filters themselves are very high quality (some of the best ND filters I’ve seen on a drone). To install them, you just remove the current UV filter that comes with the drone and screw on whatever filter you need. 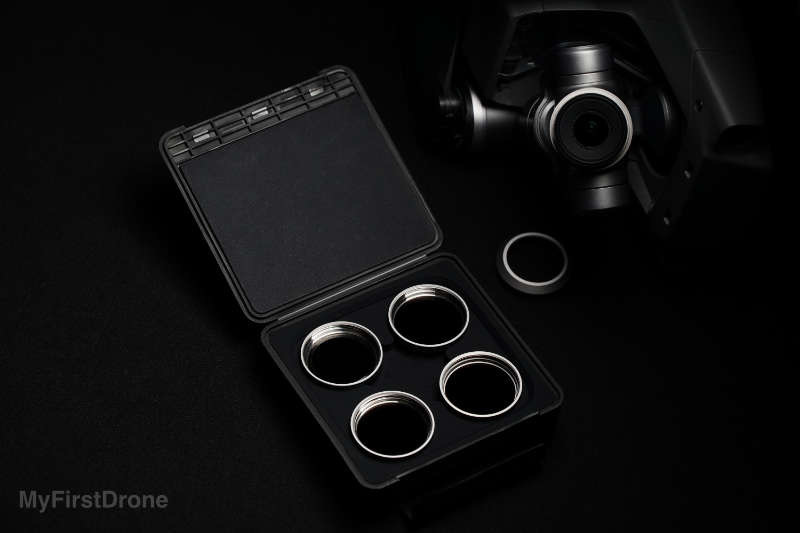 I was hoping they would have ND and CP filters for the Mavic 2 Pro, and they do show the ND filters on their site, but they’ve been out of stock from the beginning of the launch. They do cost a little more, $20 more than similar filters for the Mavic 2 Zoom since the glass is much larger, but I’m glad they are offering them so soon after the release. Let’s just hope they get them back in stock soon. The Mavic 2 Pro camera might seem large in photos, but in person it’s much smaller than the camera on the Phantom 4 Pro (DJI’s larger drone with a 1 inch sensor). By making it square instead of round, that allowed it to fit in the small space on the drone, keeping the drone design sleek and relatively small. It’s amazing that DJI was able to fit such a large sensor in a tiny little camera. Aside from the cameras, both of these drones have a sleeker and more aerodynamic design compared to the original Mavic Pro, but from a distance, you wouldn’t be able to see a difference between them. The only major distinctions are the LED light placement on the two back arms that makes the Mavic 2 easier to fly when far away, and the super bright LED light on the bottom of the Mavic 2 Pro model. I actually saw someone else flying a Mavic 2 Pro the other night in my neighborhood. From a distance, I thought it was just another plane flying in the sky until I saw it flying in a way no airplane ever could! That’s when I knew exactly what it was. If you haven’t figured this out yet, the Mavic 2 Pro has a fixed lens and the Mavic 2 Zoom has a zoom lens. On the Mavic 2 Zoom, you get a 24mm equivalent field of view at the wide end and 48mm at the narrow end of the zoom range (2X crop). This means you can get lots of different kinds of shots. You can go super wide and capture everything, or zoom in for isolating your subjects from the background and getting more of a film look. Additionally, you can do 2X digital zoom at 1080p. When combining digital and optical zoom together, it’s possible to get a 4X zoom or 96mm equivalent field-of-view. This is an insane amount of zoom for such a small drone. This is DJI’s first consumer drone to have a zoom lens and it’s the only consumer drone that shoots 4K with optical zoom. Imagine the shots you could get with a zoom lens. Sometimes in a public situation, you don’t want to be intrusive so it would be nice to be able to keep your distance, but still get the shot you want. This is especially helpful when you are trying to capture images of people going about their normal activities without flying too close and distracting them. Think about things like maybe a local kids’ sports game. You want to capture the players, their emotions, the action, but you don’t want to make them lose the game! Imagine you are in Mexico at an open-air farmers market and you want to capture all the beautiful vibrant colors of the produce at one particular stand. And maybe you want to get that interaction between the vendor and her customer. You can do that on both drones, but with the Mavic 2 Zoom, you can do it in real time. This is important to me because I can make better decisions about what I’m shooting while I’m on scene. It allows me to experiment and see how different shots are going to look so I can try different things. With the Mavic 2 Pro, you can shoot in the crop mode, but you have to be zoomed in, or out. It’s not possible to zoom in and out in real time. Another situation where zoom could come in handy is where safety is involved. I can see this being useful where animals are concerned. Not all animals would pose a threat, but I certainly would not want to get too close to a herd of buffalo, spook them, and have them trample me. Besides safety, having zoom will allow you to get shots of animals you would otherwise not be able to do. Sometimes it’s because they are just not accessible by a human. Sometimes because flying too close would scare them away and then you’d never get the shot you were trying to get. Two situations I can think of that I’m going to test this out on is coyotes and dolphins. Yes, those two animals are both in my neighborhood, at the same time. In theory, I should be able to stay far enough away from the coyotes in the mountain behind my house so I can capture footage of them feasting on a pelican, or frolicking with their pups. The only way to get a close-up of the dolphins in front of my house is if you have a boat, which I don’t currently have. So when dolphin season comes around again, I’m going to test out the Mavic 2 Zoom to try and capture some pretty amazing footage of them while standing on the shore. The Parrot Anafi will do 1.4X digital zoom in 4K, but with digital zoom, there’s still a loss in image quality unless you have a very high quality lens like the Mavic 2 Pro does. The Mavic 2 Pro has a fixed lens with a 28mm equivalent field of view. It’s not as wide as the Mavic 2 Zoom but it’s not too narrow either. Personally, I think 28mm is the sweet spot for this 20 megapixel sensor. You do get a 1.4X digital zoom in 4K (more on that later), and if you crop the 4K video in post and drop it into a 1080p timeline, you can achieve up to 2.4X zoom, but you will definitely see a loss in image quality if you start lowering the resolution by zooming in. So why would DJI give the more expensive Mavic 2 a lens with no zoom? Nobody knows for sure, but my guess is that they couldn’t figure out how to do it with such a limited amount of space. On the Mavic 2 Zoom the sensor size is much smaller, so the zoom lens can be much smaller than an equivalent lens for the Mavic 2 Pro with its larger sensor. Next year, I’m sure DJI will have a Mavic 3 combining the best features of both drones, but for now, there’s going to be a compromise no matter which one you choose. The first improvement over the old Mavic Pro is D-HDR. This mode takes a burst of severn RAW photos and then combines them together to get 13 stops of dynamic range (14 stops on the Mavic 2 Pro) while also reducing motion blur and other artifacts that would typically show up when shooting traditional exposure bracketed shots. 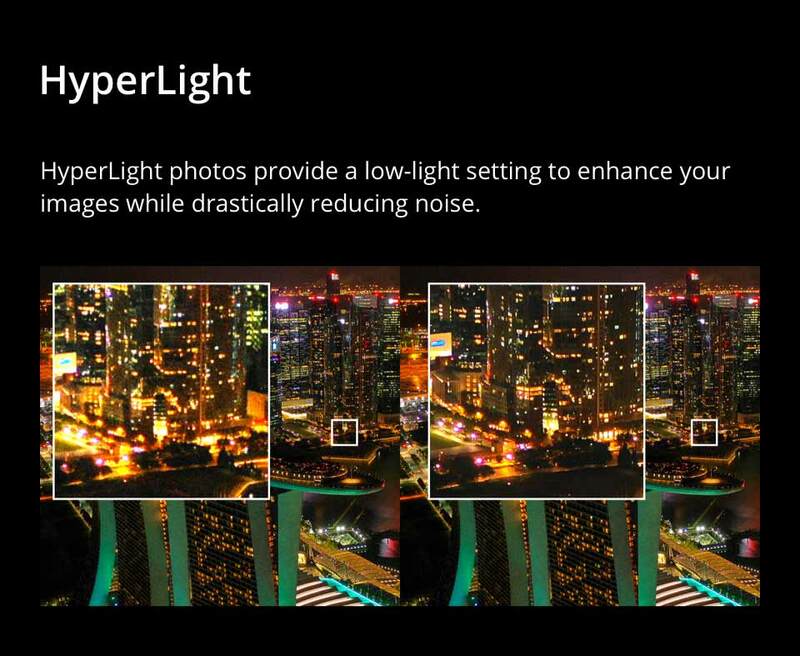 There’s also another feature similar to HDR called HyperLight. It takes a series of photos and puts them together to get the best results at night. 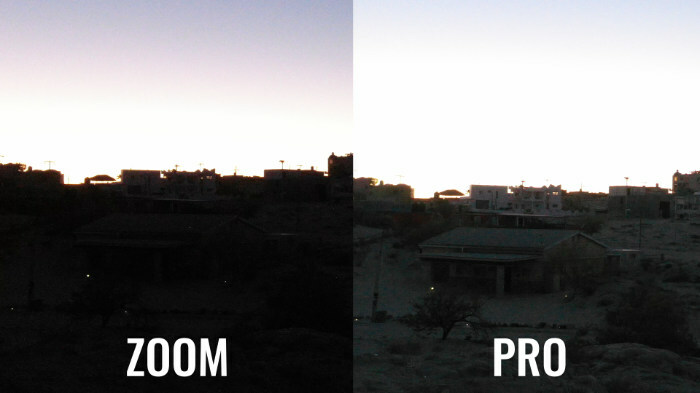 This feature is especially good for reducing image noise (the grainy artifacts that you see when shooting at night). It is possible to achieve a similar effect in Photoshop and Affinity Photo by using a feature called “image stacking”, but it’s nice to see quick and simple way of doing this without needing to go into any expensive photo editors. Although I have tried this feature, we’ll have to do more testing to see how it compares to traditional long exposure photography. Getting back to the comparison, the Mavic 2 Zoom has a 12 megapixel 1/2.1 inch sensor similar to the one found on the original Mavic Pro, but there are a few new features that give it a big boost over the old model. Besides having a zoom lens, the biggest new photo feature on the mavic 2 Zoom is Super Res. This shooting mode uses the zoom lens to take multiple images and combine them together into a Super Res image with 4 times the resolution of a standard photo. This is really useful for landscape photography, but since it requires multiple images to work you can’t use it for shots with movement. The scene needs to be relatively still with no motion and the drone itself can’t be moving. 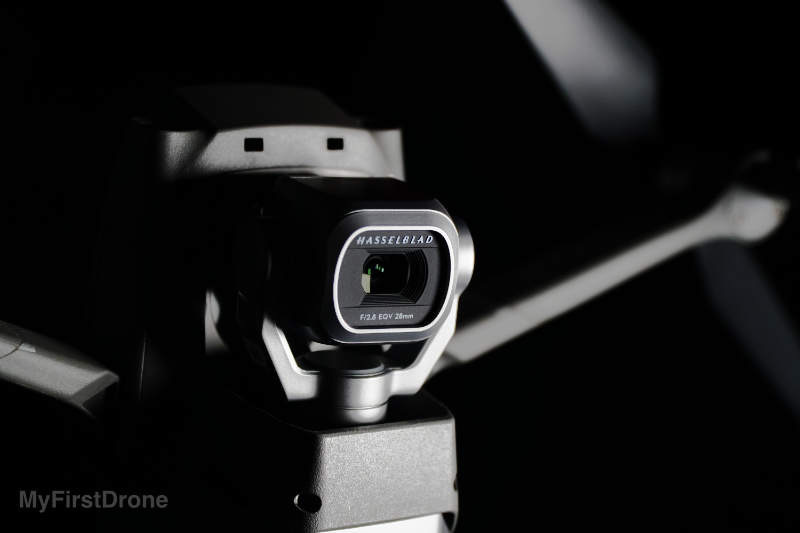 Before getting into the image quality of the Mavic 2 Pro, there are some things you should know about the camera and how it relates to Hasselblad. Back in 2015, DJI acquired a majority stake in the Swedish camera company Hasselblad. This is a company known for its super expensive medium format cameras used by famous photographers and even NASA. 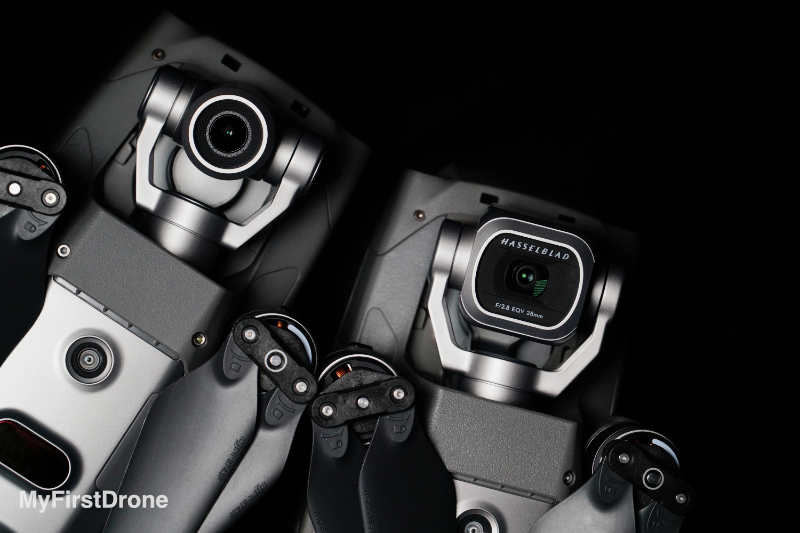 In the past, DJI did some cross branding with Hasselblad on their larger cinema drone rigs, but the Mavic 2 Pro is the first fully integrated product developed by DJI with Hasselblad technology. So what is Hasselblad all about? Big sensors, higher resolutions, and superior color science. On the Mavic 2 Pro that’s exactly what you get. So why is Hasselblad such a big deal? I’ve already mentioned the basic technical reasons but it goes way beyond that. This is a company whose story is rich and intriguing. They are known for their unprecedented reputation for quality, durability, and technology above and beyond industry standards. Probably one of the most ironic things is that it didn’t start out as a camera company at all. The F.W. Hasselblad company was founded in Sweden in 1841. It has been cultivated over a century and a half to become what it is today. The founders had a true passion for photography that was passed down through the generations. What I find interesting is that its roots were involved in flight from birds to military planes and space, so it’s quite funny that the theme is somehow carried on with the Hasselblad technology being integrated into the the Mavic 2 Pro. The Hasselblad name has come a long way. It started with some junkyard scraps and a German war plane camera. And now they are world renowned for their camera technology. The Hasselblad technology was first to fly into space along with man to capture those iconic images we all know so well. This was not even part of NASA’s plan. An astronaut purchased a consumer camera and brought it along into space with him. But when NASA saw the images brought back from that camera, they were so impressed that they developed a program dedicated to the subject. As it turned out, Victor Hasselblad had not only fulfilled his dream of making a technologically advanced highly durable camera for consumers, but it went beyond that, all the way to the moon! And what surprised everyone was that it was the only piece of equipment on the spacecraft that was not custom designed to go in space, yet it held up in space, and worked flawlessly with no other modification other than stripping down the outer casing a bit and painting it black to reduce reflections. After the moon landing, Hasselblad cameras were implemented into all future NASA space flights. This allowed the Hasselblad technology to improve even more, striving to make it even smaller, more durable, more sophisticated and lightweight to meet the demands of NASA. Hasselblad and NASA have had a long mutually beneficial history together which has allowed Hasselblad’s technology to be superior to anything else out there. So if image quality is your priority, the Mavic 2 Pro will not disappoint. If your need is a great camera especially when it comes to video, then the 20 megapixel sensor creates super sharp images. Even though you don’t get the Super Res feature, 20 megapixels is good enough for most situations and since the pixels are real, you can capture shots with movement in them (something you can’t do with Super Res on the Mavic 2 Zoom). What’s even better than resolution is the Hasselblad HNCS color science that’s built right in. What is HNCS you ask? Well, it’s simply Hasselblad’s way of rendering accurate colors in any situation. With the Mavic 2 Pro, you get amazing colors right out of the box, but if you shoot in RAW, you can process those RAW files with the Hasselblad Phocus software which will give you the best color results. 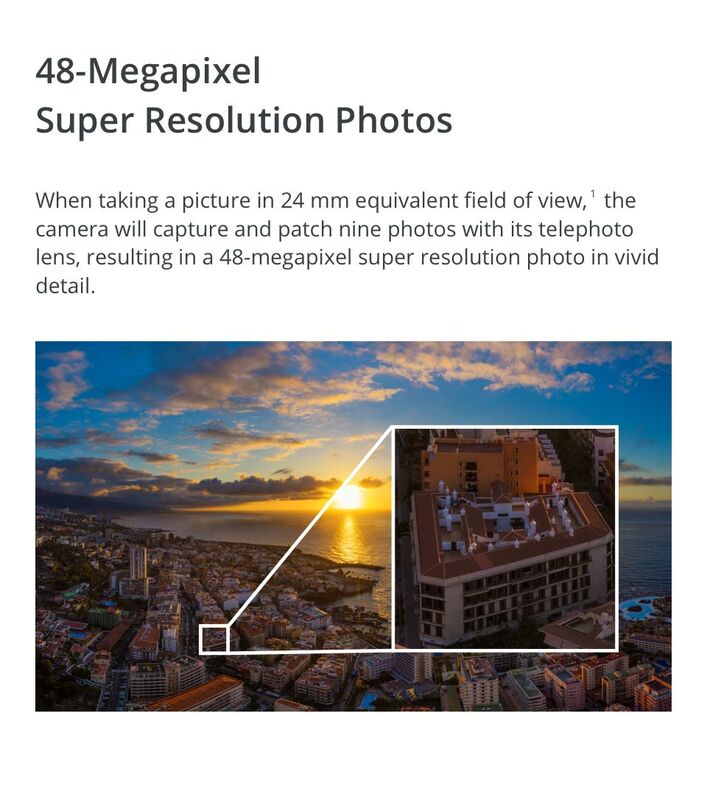 If you know a lot about cameras, you’ll know that increasing the resolution will usually decrease the size of each individual pixel on the image sensor. This means that each pixel will have less light hitting it which is really bad for low light performance. Cameras on drones like the Parrot Anafi have lots of megapixels, but the sensor size is exactly the same as the sensor size on the Mavic 2 Zoom, so each pixel is approximately half the size. The Hasselblad L1D-20c Camera on the Mavic 2 Pro has a 1 inch image sensor (the largest sensor on any drone this small), so even with the increased megapixel count each physical pixel is still bigger than the pixels on the Mavic 2 Zoom. This and the improved sensor technology is what gives the Mavic 2 Pro better low light capabilities. One detail that nobody seems to be talking about is the fact that the Mavic 2 Zoom doesn’t have an adjustable aperture. The lens on the Mavic 2 Pro has an aperture that goes from f2.8 to f11. This gives you much more flexibility for long-exposure photography and any other situation where more precise exposure control is needed. The only thing that you should be aware of is that changing the aperture can have a negative effect on the overall sharpness of an image. For example, If you shoot at f2.8, only a small portion of the scene will be very sharp and the background will be out of focus. This is called a shallow depth-of-field. 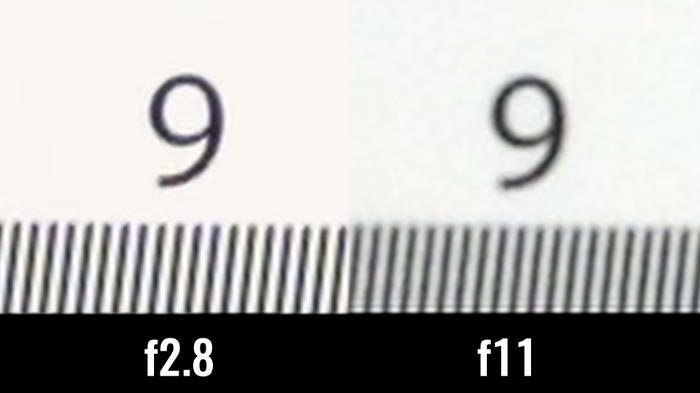 Shooting at higher numbers like f11 will make everything stay in focus, but the image overall will be slightly soft. If you don’t like soft images, you should shoot at f2.8 to f5.6 for the sharpest results. For close up shooting, the larger sensor combined with the f2.8 aperture also allow you to blow the background out of focus for getting a DSLR-like look. This was something previously not possible on consumer drones. RELATED: DJI Mavic Pro vs Mavic Air - Is the Air still Better? The video quality has improved greatly. This is mainly due to better colors, higher bitrate, and a new video codec. The colors on the Mavic 2 Zoom are very similar the the Mavic Air. Everything just looks less magenta too me compared to the old Mavic Pro. Recording in 4K is great, but resolution doesn’t mean anything if the bitrate isn’t high enough. All recorded video is compressed by the camera before it hits the SD card. The bitrate of a video basically controls how much it gets compressed. So the higher the bitrate, the less compressed your video will be. Both the Mavic 2 Pro and Zoom also record at 100Mbps (40Mbps faster than the Mavic Pro), but the biggest improvement is the new H.265 video codec. HEVC (also known as H.265) is a video compression format just like H.262, but it’s able to maintain almost the same video quality while taking up half as much space. That means when you shoot in H.265, you’re really getting the same quality as if you were using H.264 and shooting at twice the bitrate (200Mbps in this case). The Mavic 2 Zoom has two video features that you won’t find on the Mavic 2 Pro. This is what makes the decision so hard for a lot of people. 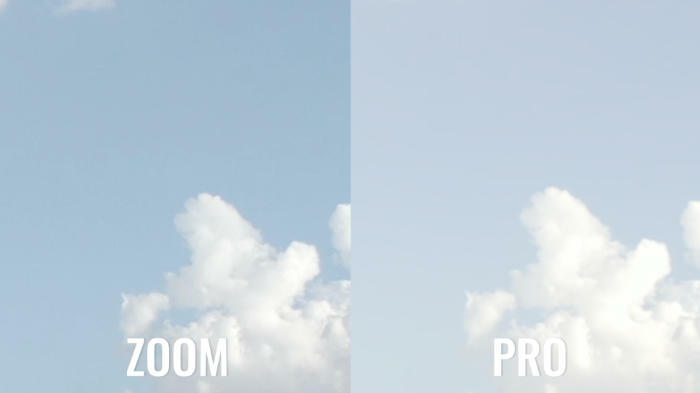 The first is called Dolly Zoom (it’s one of the DJI Quickshot modes). This feature is hard to explain, but basically as the drone flies backward, the Mavic 2 Zoom will zoom in slowly at the same time to create a really unique perspective shift. It’s a shot that would normally take a lot of practice to get just right, but the Mavic 2 Zoom does it all automatically for you with the touch of a button. You could essentially create this effect with any camera drone, or camera for that matter, but it’s more difficult to achieve the best results without practice and experience editing your footage in software. To do this, you would first fly the drone out, back away from your subject at a decent speed. Then in post production, you would zoom in at that particular segment of your footage. But you won’t be able to tell exactly what you’re going to end up with until later. It’s essentially an optical illusion caused by the relationship between the foreground and the background and distortion or compression. The foreground basically stays the same size, while the background grows bigger which creates a 3D parallax effect. This cinematic effect was made famous by English film director Alfred Hitchcock when he used it in his 1958 film, Vertigo. It can really add a lot drama to your shot depending on what you’re trying to convey. Even animated films use this type of effect to make the viewer engage in the film the way the filmmaker intended. In Lord of the Rings, they used the dolly zoom effect to make it seem like the space between the trees in the forest was getting wider as if a another portal was opening up. There’s a ton of examples out there that you may not have realized were using this effect until now. The other feature that the Mavic 2 Pro doesn’t have is phase-detection and contrast-detection continuous autofocus. On the Mavic 2 Pro, you do get autofocus, but it’s not true continuous autofocus, so when you fly really close to something and then far away it doesn’t continuously keep the scene in focus. There are ways around this, like setting the aperture to a high number so that everything is in focus, or sliding the focus control manually while flying, but I would’ve liked to see the same focus system in the Mavic 2 Pro since it is the more expensive drone. So why buy the Mavic 2 Pro if the video features aren’t as good? Well, keep reading, this is where things get interesting. The Mavic 2 Pro may be lacking some of the cool features of the Mavic 2 Zoom like continuous autofocus, but the Mavic 2 Pro has some secret weapons that many people might overlook. Even though the Mavic 2 Pro doesn’t have an optical zoom lens, because of the 20 megapixel sensor you can shoot video in a 4K crop mode that gives you approximately 1.4X lossless zoom. In fact, when shooting in the 4K crop mode, you actually get better video quality because the resolution of the sensor with a 1.4X crop and the resolution of the 4K recording mode are exactly the same. 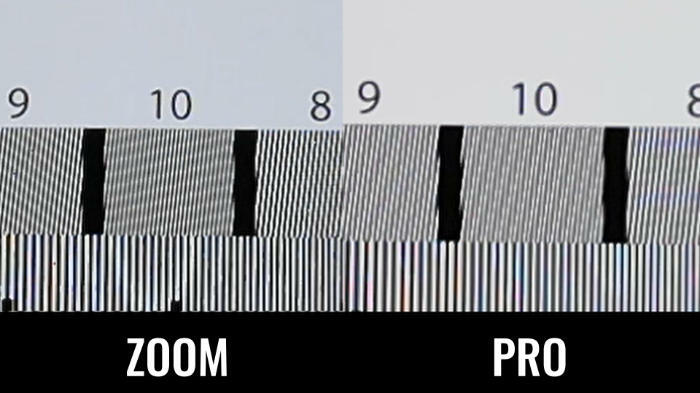 This means the pixels don’t have to scale up or down to the right resolution. When I first got the Mavic 2 Pro, I was shooting in the standard 4K “full FOV” mode, but after trying out the “high quality” crop mode I liked it so much that I haven’t taken it out of that mode since getting the drone. The narrow field-of-view combined with the increased quality makes everything look great. This next feature is what makes the mavic 2 Pro worth the extra $200 for me. The 10-bit Dlog-M color profile is the single greatest feature of this drone, and after using it, I don’t want to use anything else. 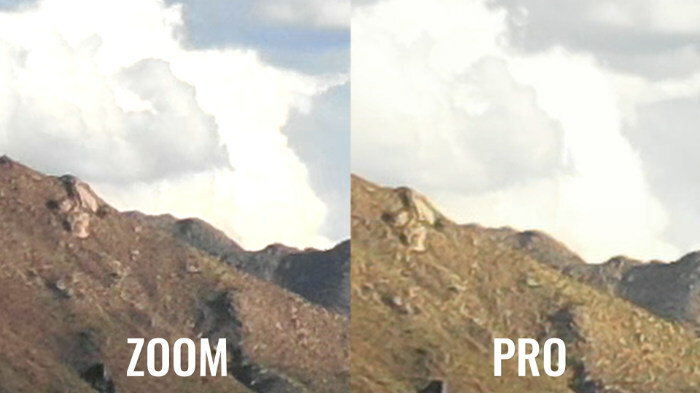 If you’re not familiar with log color profiles, they’re basically a way of getting more color or dynamic range from an image without shooting RAW uncompressed video. To do this, the highlights are pushed down and the shadows are pushed up so they don’t get overexposed or underexposed. To understand Dlog-M better, you need to first understand how video is captured and recorded. All consumer cameras record video by capturing a bunch of images using the sensor located behind the lens, compressing the images so they take up less space, and then turning them into a video file that your computer can read and play back. Before the camera compresses the images captured by the imaging sensor, these images have lots of detail, but since most video monitors, TVs, and phone screens wouldn't be able to display super bright and dark colors, most cameras just cut out any information that is not within the range of a standard monitor. The big problem with doing this is that you can never record all of the lighting information in a scene, so you have to capture just the colors in the middle ranges since that is usually what is the most important. Once an image has been over exposed or under exposed, all of the details in the highlights and shadows will be lost and you will see nothing but black and white in these areas. When shooting around sunset (the golden hour for shooting video) it's very hard to capture all of the details of a scene in the same way that your eyes can. In most cases when you are shooting into the sun (like a sunset shot for example) the sky will be blown out completely if you want to keep the details in a person's face. With Dlog--M, all of the color details are retained by taking all of the lighting information that comes from the image sensor and compressing it into color space that is viewable on any monitor. Since all of the color information is being scaled down, that's why Dlog-M footage will start out looking a bit flat and ugly. It's not meant to be uploaded directly to youtube. Once the video is in a video editor, you can then stretch the colors out using color tools to get the footage looking exactly how you want. If you don’t do any color correction to your footage and you never plan on doing it in the future, you can ignore this section. If you are interested in color correcting and grading, then let me introduce you to the concept of color depth and why it’s important. All of the image frames that make up a video file have three main channels of color information inside of them (red, green, and blue). When the RGB information is displayed on a monitor, you see a full color image. Each of these three channels has 8 bits of luminance information. This means it’s possible for the image to have 256 shades of red, 256 shades of green, and 256 shades of blue. 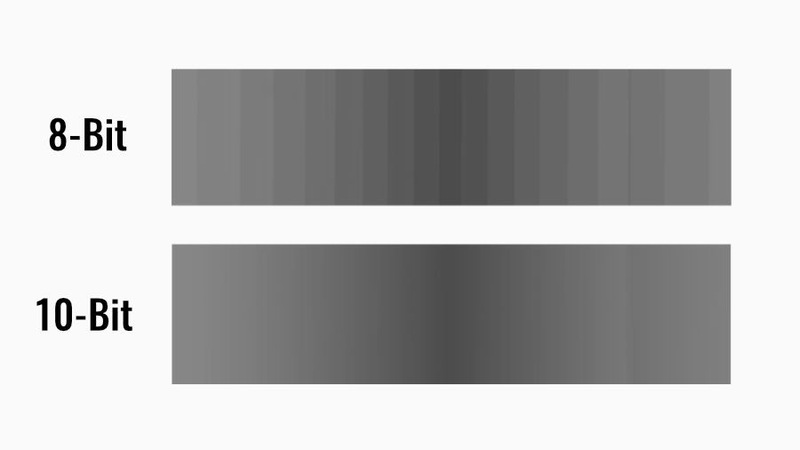 On a 10-bit image, each channel has 10 bits of luminance information, so you get 1024 shades for each color instead of 256. If you multiply the RGB channels together (256x256x256) you get about 16.777 million possible colors in a 8-bit image. Doing the same math on a 10-bit image there are over 1 billion colors. That’s about a 64x increase in colors! Unfortunately, the human eye can only see about 10 million colors, so shooting 10-bit video is useless right? Well, if you don’t plan on color correcting and grading, yes, it is completely useless. If you are working with color, this is a pretty big deal. It means you can scale the colors up and down, creating more contrast between different parts of the image without seeing the gaps between one color tone and another. This is especially important with D-log footage since the colors need to be stretched out just to get the image looking true-to-life again. Drones like the original Mavic Pro had a log-color profile, but because of the low bitrate (60Mbps in 4K) you really couldn’t do too much to the colors before seeing all kinds of terrible video compression artifacts. On the Mavic 2 Pro, thanks to H.265, a higher bitrate, and the 10 bit color depth, all of these things combined make footage much easier to work with when it’s time to play with color. Using the 10-bit Dlog-M color profile, you can also create HDR videos for playback on HDR compatible TVs, but if you’re not familiar with HDR workflows, there’s also an HDR video shooting mode that uses the HLG (Hybrid Log Gamma) color standard. Using the HLG mode, you can shoot in HDR and view it directly on compatible devices without doing any editing. 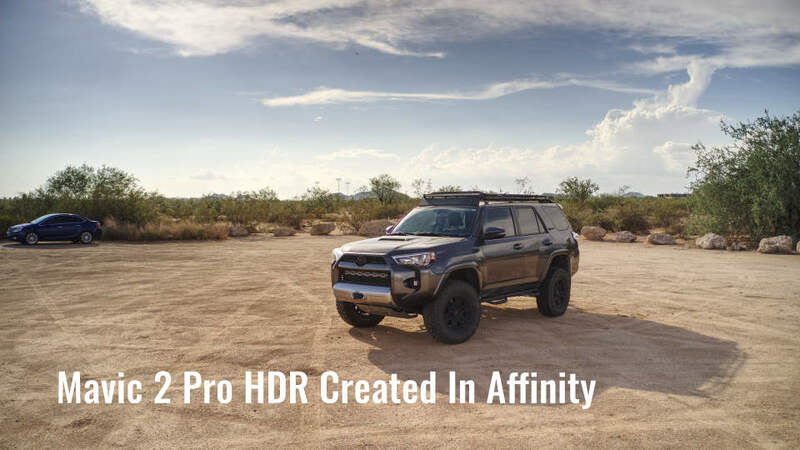 This is great for consumers that want to output true HDR content, but for more control and flexibility in post, you should still shoot in the Dlog-M color profile. In this section, we’re going to be diving deep into the video quality of both drones. This is where you can take all of the knowledge you’ve learned and use it to analyze our real world examples. Please note that all of these tests will be done in the video mode unless explicitly mentioned. If there’s anything we didn’t cover that you want to see, leave a comment bellow. This first test was shot in the standard color mode on both drones with the white balance set to “sunny” and identical exposure settings. The first thing I noticed was how natural the colors looked on the Mavic 2 Pro compared to the Zoom. Brown dirt simply looks brown, not red. The highlights don’t look much different to me, but the shadows definitely have more detail. Since these tests were both shot in the standard color profile, you won’t see any extra dynamic range. Before color correcting and grading, you won’t see much of a difference between D-Log and D-Cinelike. There’s a bit more dynamic range and the colors will obviously be more accurate since Hasselblad’s HNCS is being applied to all of the shots, but that’s about it. Surprisingly, D-Cinelike on the Mavic 2 Zoom has a pretty good amount of dynamic range (more than the Mavic Air at least). 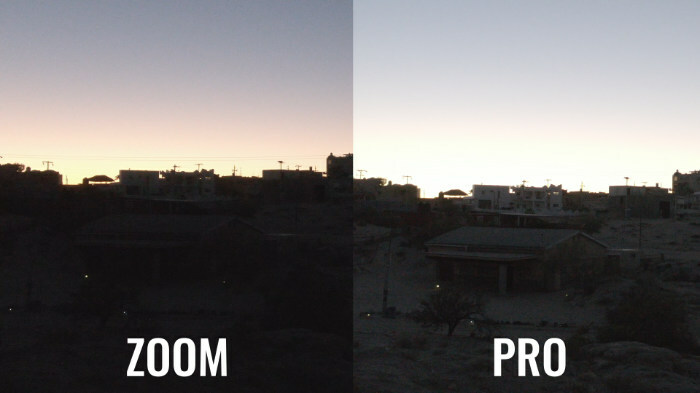 After color grading, this is where you can really see the differences. On the Mavic 2 Zoom, there’s a massive amount of color banding in the blue sky. On the Mavic 2 Pro, all of that is gone thanks to that 10-bit color we talked about. The only artifacts that still remain are from the H.265 compression, but unfortunately that’s only solvable by moving up to the more expensive Inspire 2 drone. This is a subject I don’t see many people talk about when it comes to drone cameras, but all lenses will have some amount of artifacts and these to drones are no exception. If you didn’t know, chromatic aberration (otherwise known as color fringing) is the purpled/green image doubling effect that you see when zooming in to high contrast parts of the image. Most lenses will also have more fringing on the corners of the image. Coming back to this cloud picture, you will see that I altered the colors slightly. For easier web viewing, both shots have a custom color filter on them that brings out the color fringing artifacts. If you want to see a more real world example, look back at the 10-bit example photo from earlier. On the Mavic 2 Pro, as you zoom into the corners of the image, there is some fringing visible but it’s not bad at all. On the Mavic 2 Zoom, there’s noticeably more color fringing than the Mavic 2 Pro, but it’s not terrible. Zoom lenses tend to have more fringing than fixed lenses anyway. The results here are very interesting. For this shot, I pointed both drones at a sharpness chart and made sure that both drones were at the same distance from the chart. Before recording, I also set the exposure and focus on both drones. The Mavic 2 Pro aperture was set to f2.8 and the Mavic 2 Zoom was zoomed all the way out to achieve f2.8 (since there is no aperture control). Looking at the results, the Mavic 2 Zoom is a bit sharper than the Pro. Why this is, I have no idea. I did the same test after with RAW photos instead of video and the Mavic 2 Pro had much more detail, so whatever is going on here is video related (not the lens). 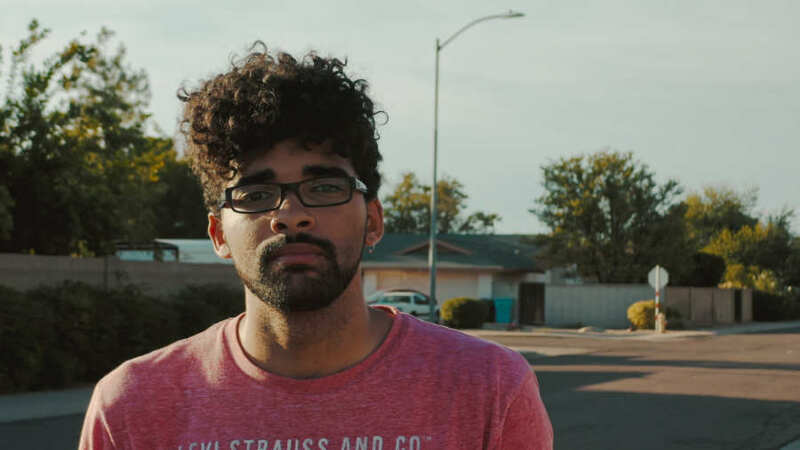 Some people like really sharp videos, others think that the softer look is more cinematic. Personally, I don’t mind the softer look, but it would be nice to know what is going on here. If anyone else is seeing this, let me know in the comments. Since aperture can also affect sharpness, I did some tests at every aperture setting to see how soft the video would look at higher values. At f2.8 to f5.6 everything looks good. After f5.6 you start to lose sharpness. Personally, I wouldn’t use f11, so if you want to get the perfect aperture and shutter values to achieve that cinematic look, make sure you get ND filters. Out of all the features of these two drones, the optical and digital zoom is probably the hardest to understand, so hopefully after seeing these tests you’ll finally see the bigger picture. This first image is a visually correct example of what the different zoom ranges look like on both drones. There are 4 example boxes. 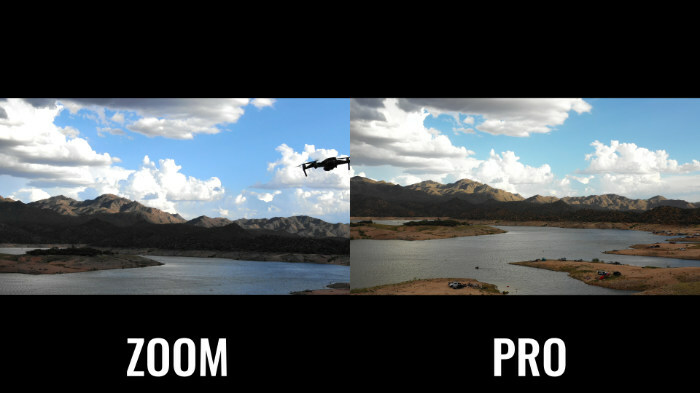 The first represents the Mavic Zoom at its widest optical setting (24mm). The second is the Mavic 2 Pro it its widest digital setting (28mm). 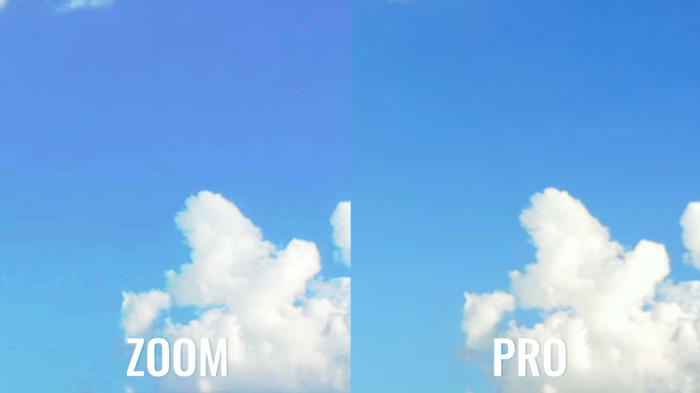 The third example represents the Pro when using the HQ Crop mode that crops in while still recording true 4K video. The fourth (smallest) box is the Mavic 2 Zoom when Zooming all the way in (48mm). This next image is a real example of what each drone looks like when zoomed in. 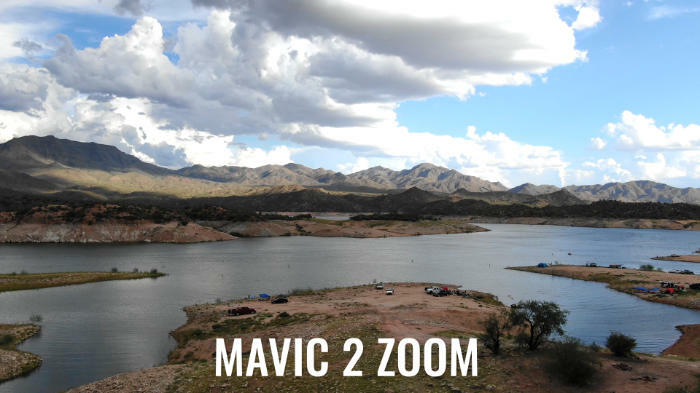 On the left is the Mavic 2 Zoom optically zoomed to its maximum focal length. On the right is the Mavic 2 Pro zoomed in using the HQ crop mode. Both drones were using the same shutter speed and ISO settings. On the Mavic 2 Zoom, you can immediately see that the image is darker, but more zoomed in. This is because of the aperture value that changes when you zoom in. This last picture is exactly the same as the image above it, but I’ve zoomed into both videos using editing software and matched the framing and scale so you can see how much detail is in both images. 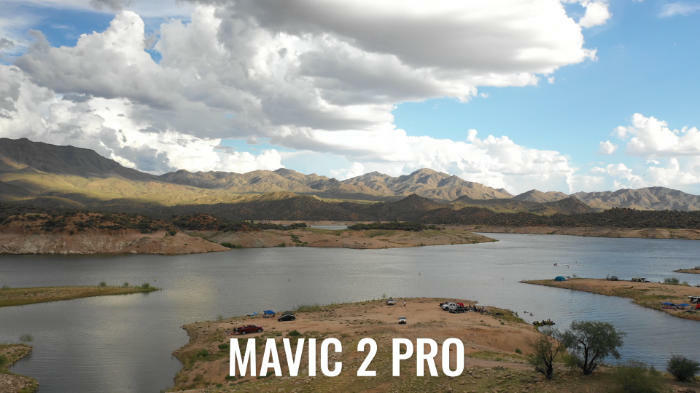 Obviously since the Mavic 2 Zoom has a narrower field-of-view, you will see more details than on the Mavic 2 Pro, but the difference is not really as big as I was expecting. This is one area where the larger sensor on the Mavic 2 Pro really pulls ahead of the Mavic 2 Zoom. The shot above is a still frame from a video recorded at ISO 3200. Before doing any other tests, I could already see that the Pro had a big advantage. At ISO 3200 the Mavic 2 Zoom is simply unusable. The Pro doesn’t look great, but with some noise reduction in post, I think it would pass as usable. This next test shows just how bad things get when you use optical zoom. This shot was also at ISO 3200, but on the Mavic 2 Pro, I used the HQ crop mode and on the Mavic 2 Zoom I zoomed in optically to 48mm. 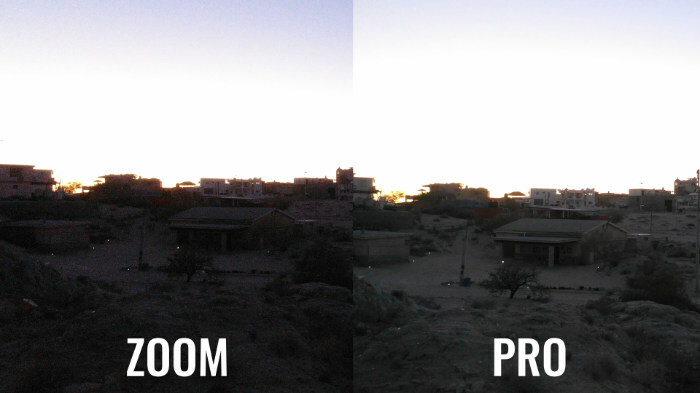 Just like in the optical zoom tests, the image on the Zoom gets much darker when you zoom in. This means you can forget about trying to use the zoom feature when it gets dark out. Just to make sure that the color settings weren’t making the images darker, I did another test using the D-Cinelike color profile on the Mavic 2 Zoom and Dlog-M on the Mavic 2 Pro. Looking at this next image, you can see that it did bring out a bit more detail in the shadows, but not enough to capture good low-light shots. Which Drone is Right For You? The Mavic 2 Zoom is $1,249 and the Mavic 2 Pro is $1449. That price gap might sound like a lot, but it all depends on how you look at it. By spending the extra $200, you’re basically getting better colors, better low light, and higher resolution. That’s why the Mavic 2 Pro gets the Hasselblad branding. 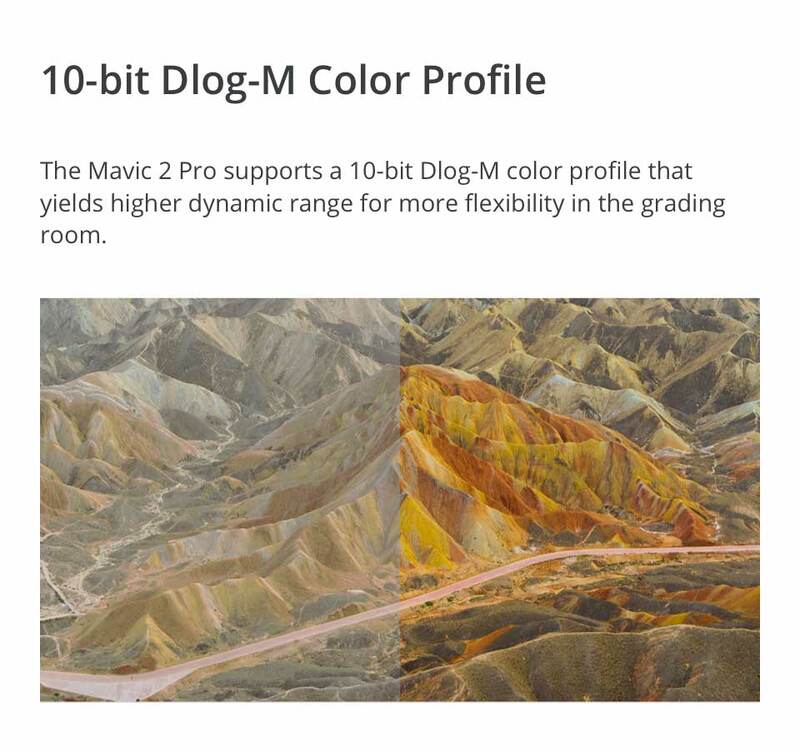 For me, after using the Dlog-M color profile, there’s no other drone on the market (including the Mavic 2 Zoom) that I would consider buying. That one feature is worth the extra price and every other feature is just a bonus. I’m not the average consumer though, and what you want might be slightly different from me. There’s really no going wrong with either of these drones. If you really want the zoom functionality, get it. 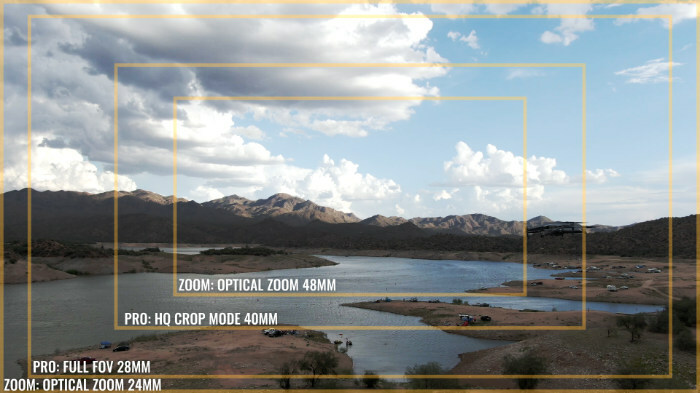 Just know that the 4K crop mode on the Mavic 2 Pro is equivalent to a 40mm lens which is only 8mm less than the optical zoom on the cheaper Mavic, so don’t think that you’re losing out on a lot if you get the Mavic 2 Pro.